I’ve never played Dungeons and Dragons or any tabletop RPG. I can barely sit through a session of Monopoly, so I can’t imagine slogging through a DND campaign spanning weeks or even months. I’ve heard, though, that the key to a good game of DND is a good dungeon master. The dungeon master (DM) is tasked with telling an engaging story for the game. With any luck, this person brings your little figurines to life so they can play parts in a grand narrative. Crimson Shroud has a dungeon master with the same goal in mind, and it brings that same slow feeling to a typical RPG experience. What makes Crimson Shroud interesting is its unique sense of pacing. The man, the one in that spreading pool of blood, isn’t moving. You wonder at his wounds but realize that leaving your cover would make you a target for more arrows. And there are always more arrows. This was Crimson Shroud’s DM filling in blanks left by Giauque’s lifeless figurine. In order to imitate a tabletop RPG, Crimson Shroud never moved any of its characters; instead, it let them stand still on grimy castle boards. Like a DM, it uses narration to convey action. The above quote is a pretty good sample of the writing style here; it tries a little too hard to be cool and stylish, but it’s still polished and engaging. At worst, it’s campy, and I’d never call it boring. Considering that the game has narration where most RPGs would have a character up and perform the action, I was grateful that the text was as interesting as it was. Still, it was hard not to skip through it to get to some combat. 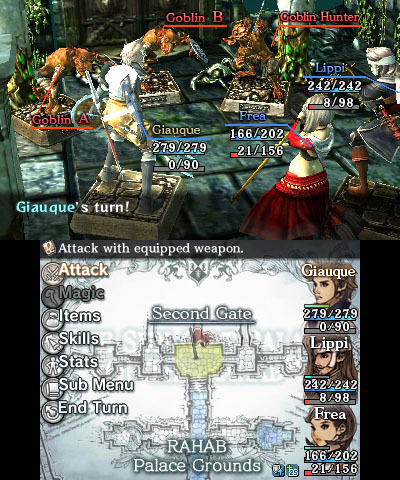 I dig a good menu-based RPG scrap, and when an RPG is in my hands, I generally rush to the nearest fight as quickly as possible. Soon enough, the DM finished its intro and plopped my party into battle with two goblins. Battle was more or less standard fare; my party consisted of a well-rounded fighter, a ranger with slightly worse stats, and a mage. Each one could use a standard attack or a variety of magic moves, and each magic move would drain magic points (MP). Unless you’ve never played an RPG before, it’s all stuff you’ve seen. During this initial fight, Crimson Shroud took care to teach me about magic combos. Most magic has an element, and if you can cast enough magic spells without reusing an element—along with a few other nuances—you’ll earn collectible dice. These dice can add potency or accuracy to your moves, but if you want to make a worthwhile dent in either area, you’ll need to use several dice at once. Since you can only keep several at a time, I found that they played a minor role in combat. On the plus side, the dice mechanics meant that no enemy was impervious to magic. If my sleep spell had a 0% chance of working on a boss, I could add a die to accuracy for a shot at getting it through. I’m a fan of this, since all too often are RPG bosses just plain invincible to status effects. But moreso than the run-of-the-mill battle options and rarely useful dice mechanics, combat was defined by its pace. In the opening fight, I faced two plain ol’ goblins, and each one took several turns to fell. Even the most lowly grunt will put up a fight in Crimson Shroud. When I finally slew them both, I got to explore the castle they had guarded. Rather than guiding avatars around each square inch of the area, though, Crimson Shroud had me pick a room and instantly navigate to it. Instead of facing random encounters, I was prompted to battle when I entered certain rooms. So, if navigation wasn’t going to give me any cooldown time between fights, I needed something else. The DM was happy to fill that role. Text is easy to skip in Crimson Shroud, and you rarely need to read it in order to know what to do next. Under normal circumstances, I’d be more than happy to skim the story. After a lengthy battle sequence, though, I was glad to rest with a few pages of text. Story bits can range from a few lines musing over disgusting zombie goblins to smile-worthy tales of how you escaped the bad guys that one time you met your magical girl companion. And I stayed engaged in the story because it didn’t bog me down in details. Characters might have serious discussions or recall a long backstory, but I never read about the minutia of a room or anything like that. Crimson Shroud does follow some fantasy tropes in its storytelling, but its narrative focus is pleasantly narrow. Which left me ready to dig into even longer fights. Over the time, I realized that sustainability was the key to survival. If battles were going to take forever, I needed to find a way to make my party live longer than forever. In one particular fight, I faced a giant skeleton, a skeleton archer, and a skeleton mage. 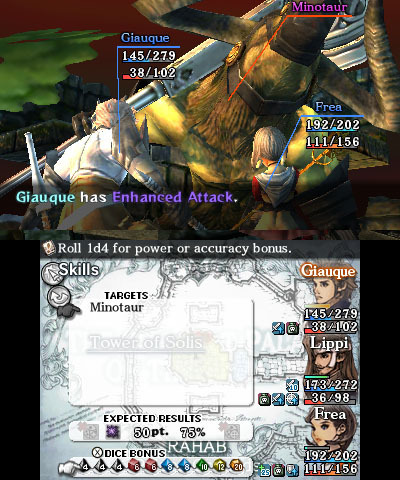 I could dodge the giant’s attacks by raising my party’s agility, but the archer and mage would still wreck them. The thing is, both the archer and the mage would respawn upon death—if I tried to clear them out, they’d wear me down before I could get to the giant. Since the mage was more or less immune to my magic, I opted to put the archer to sleep. With one sleeping archer and one giant that couldn’t hit the broad side of a barn, I could focus all my energies on killing mages. After the fourth mage, they stopped coming. From there, I took out the archers one by one, then finally moved onto the giant. Battles often revolved around finding some kind of holding pattern like the one above. With each fight, you’re in it for the long haul, so I’d find a way to create a state where my party members could survive indefinitely. 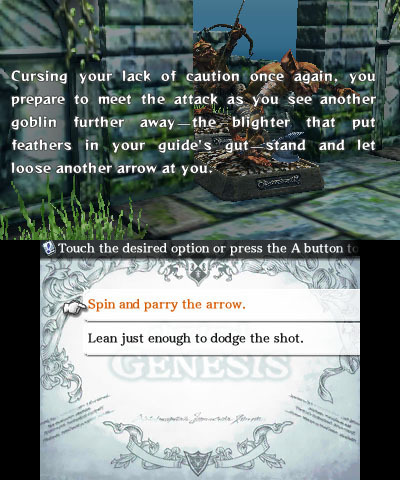 In this case, I prevented my party from getting overwhelmed by rendering the archers and giant ineffective. The battle mechanics work well in service of this idea. MP will regenerate during battle, meaning you can use magic indefinitely. On the other hand, because skirmishes last so long, you don’t want to figure consumable items into your battle plans. If you do, you’ll quickly run out, so they’re there for emergency use only. There are also no experience levels here, meaning you can’t grind out levels to cheese a certain segment. These mechanics are hardly groundbreaking, but here, they’re used to create a unique sense of pacing. At the start of Crimson Shroud’s first chapter, my party arrived at a castle. An hour and a half later, after only a handful of battles, a few pauses for dialogue, and traipsing through a few rooms, I came to the end of the first chapter. Rather than move on to a new setting, my party ventured into the castle’s basement. I had only scratched the surface of this one setting, and Crimson Shroud wasn’t going to let me leave until I had seen all its dark depths. This game takes its time with what it does, whether by storytelling or by battle, creating a hearty experience. Crimson Shroud repurposes familiar elements in an interesting way. It’s high quality, no doubt, but it doesn’t have much of anything new to say. Value Verdict: Purchased new in 2012 for $7.99. This took me 7 and a half hours to complete (that’s in-game time), and there’s a new game plus mode to explore. If you can derive enjoyment from vanilla turn-based RPG bouts, you won’t need to worry about getting your money’s worth here.